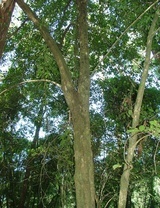 Description: Shrub to medium-sized tree. Leaves elliptic to oblong-elliptic, shortly pointed, mostly 3–10 cm long, 1.5–4 cm wide; petiole 3–5 mm long. Flowers pedicellate in leaf axils, but not on a common peduncle. Perianth 2–3 mm long. 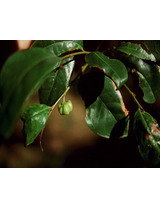 Capsule stalked, solitary in leaf axil, 12–20 mm diam., green turning whitish pink to deep red when ripe; segments opening and exposing a pair of flattened seeds in each loculus; seeds covered by a red aril; ripe Nov.–Feb. Distribution and occurrence: widespread in coastal districts. 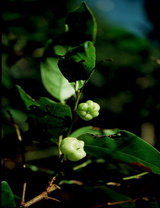 Glochidion was previously included in Euphorbiaceae. Text by T.A. James & G.J. 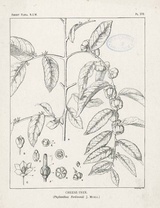 Harden, Flora of New South Wales Vol. 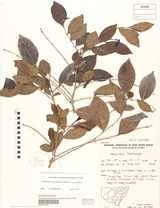 1: 400-401 (1990), in Euphorbiaceae.